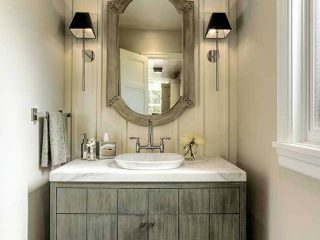 With no bathroom storage prior to the remodel, the homeowner insisted on it, and even added a small chest that was used in her grandparents’ bathroom years ago. 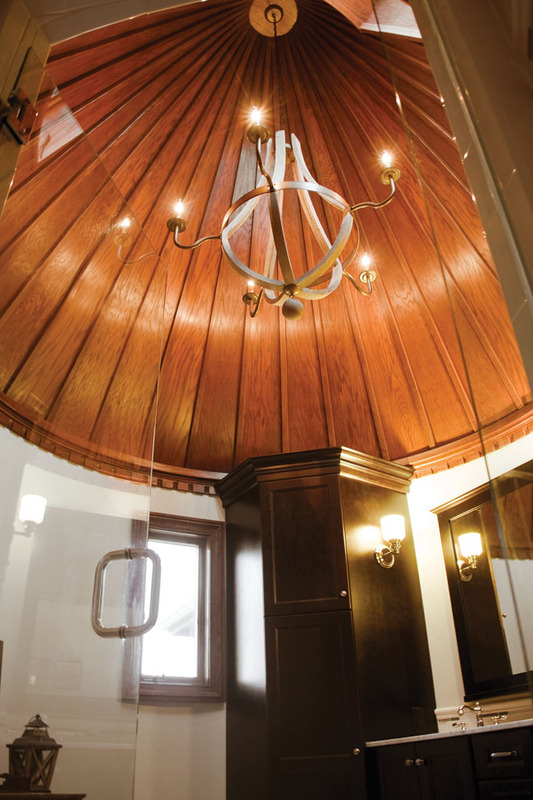 Guests walking into the round entryway of the Tudor-style home of Diana and McKay Featherstone in Tipp City are impressed with the space’s distinctive look. 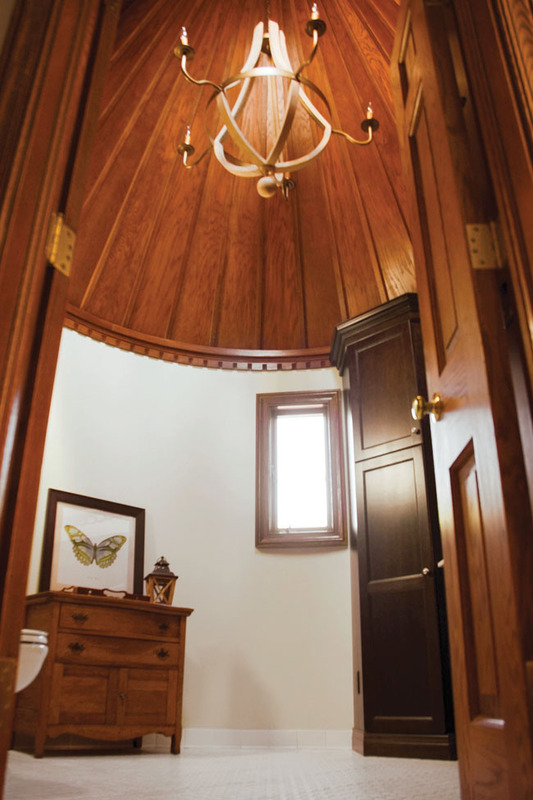 But little do the guests know that an even more impressive interior is on top of the entryway, in the master bathroom which is the top half of this turret that’s located on the front of the home. Yes, it’s a round bathroom. 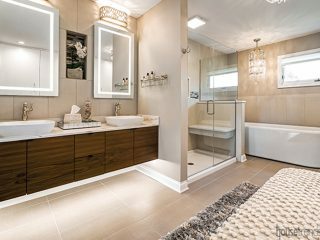 Now with a unique and classic design, this bathroom wasn’t always as appealing. The house was built in the 1980s and when the Featherstone family moved in 2012, it was time for a significant re-do of many rooms, including the master bath. The bathroom’s interior was gutted, removing the pedestal sink and toilet (both navy blue), tile, shower interior, flooring—and the bathtub. 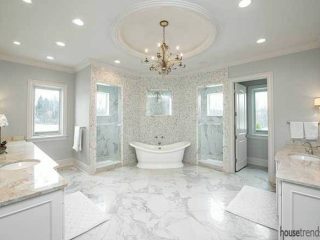 “Today, about 90% of bathroom remodels eliminate the bathtub,” reports Aaron Mauk, owner of Mauk Cabinets By Design, who worked on the remodel. 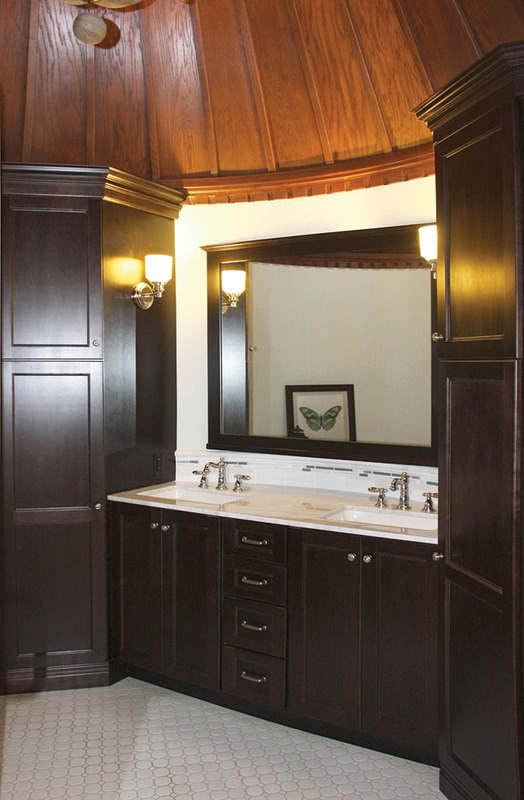 But what was absolutely going to remain in the bathroom was the showstopper of the room then and now: the gorgeous cone-shaped ceiling constructed of slatted wood, trimmed with dentil molding. Mauk and the Featherstones worked well together, selecting items for the new bath. “Throughout our house, as we’re redoing rooms, we’re choosing a classic look to stand the test of time,” Diana shares. 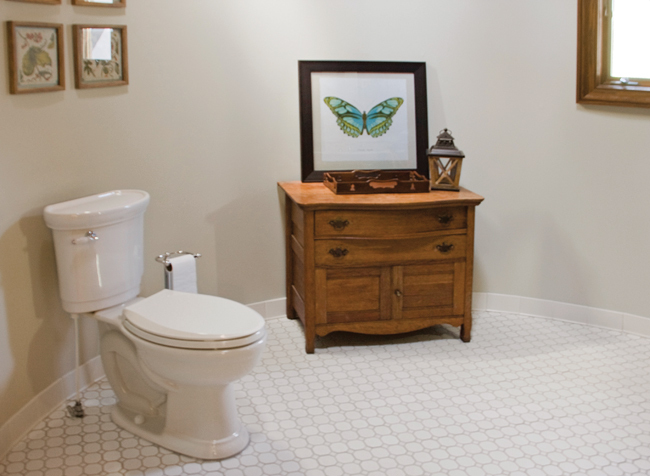 For the bathroom flooring, classic octagonal shaped white tiles were chosen, to be in harmony with the circular room. Sherwin-Williams’ Sea Salt paint, which features a cool gray-green tone, was selected for the walls, to give a restful feeling. Thanks to the additional floor space cleared by removing an unused bathtub and pedestal sink, Diana was pleased to have a spot for a small chest of drawers that was, coincidentally, used in her grandparents’ bathroom years ago. The double sink vanity and the companion towers on each side all appear to have a rounded back. But in fact, they have typical flat backs. Mauk achieved the circular look, first, by topping the vanity with a marble counter that’s rounded on the backside. The partially rounded countertop is placed atop a flat-backed cabinet and voila! It fits a rounded wall. The cabinet towers are flat-backed as well but to make them appear rounded, Mauk placed panels of the same wood, to “v” out the tower, making the tower appear to be rounded on the backsides. The walk-in shower got a thorough redo thanks to white subway tiles. 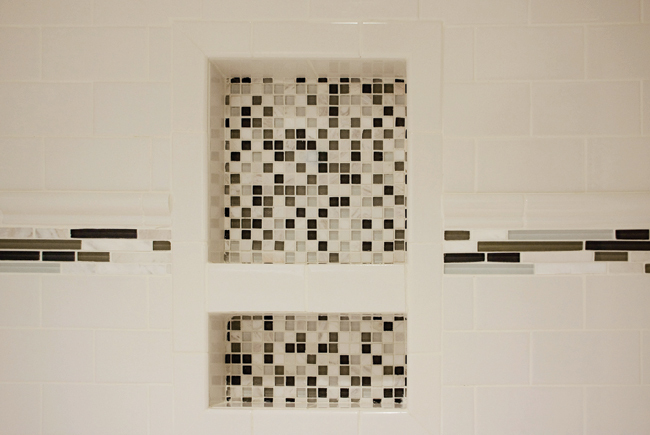 The same glass tile used for the backsplash was included as a focal point in the shower. Mauk explains that tiling the shower area from floor to ceiling is a trick that results in less maintenance and a taller feel. 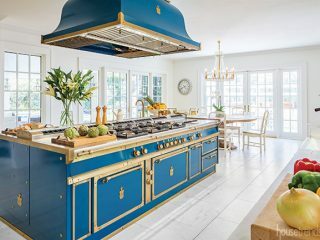 Brass fixtures were replaced with classic chrome.